Europe Oil Filled Distribution Transformer Market size for 2017 was valued over USD 1,100 million and is set to exceed an annual installation of 200 thousand units by 2024. Europe oil filled distribution transformer market on account of bulk investments from financial institutions including the World Bank has gained an appreciable escalation over the years. The demand for phase change and auto-transformers over the past decade has witnessed a two-fold growth across the region. In addition, European Investment Bank in 2017, allocated USD 5 billion towards renewable integration and upgradation of distribution networks. Regulatory inclination towards renewable network expansion, thrust the demand for modernization and revamping to further achieve effective grid integration. In addition, stringent energy efficiency protocol across the region have compelled utilities to either enhance or replace existing electric distribution components with energy efficient systems. Furthermore, ongoing expansion of cross-border distribution projects in compliance to the European interconnection policy will embellish the Europe oil filled distribution transformer market. 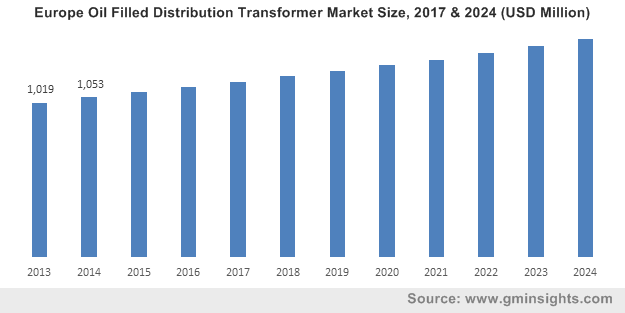 The Europe oil immersed distribution transformer market has significantly been influenced by expeditious digitalization with growing usage of smart artificial intelligence systems. Although certain industries have escaped the digital turnaround that has engulfed the region, the electricity sector has remained adamant on the periphery. IT implementations have witnessed under-investments across the regional power sector with major participants focusing on capacity addition of their respective segments. However, in the past decade the industry has paced up owing to an avid demand for interactive and smart services by consumers. A paradigm shift toward IT integration across the electricity sector will considerably foster the smart grid deployment, which in turn will complement the business outlook. 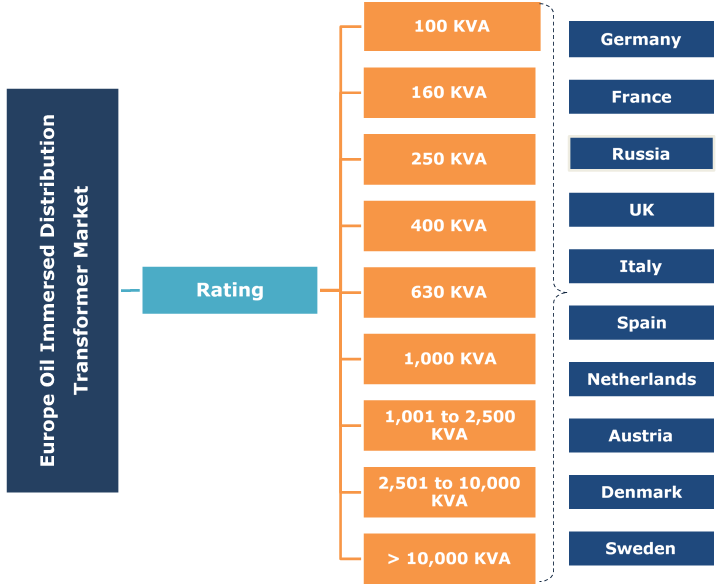 Availability of a variety of transformer configurations across the European markets, consumers have aligned their focus towards the adoption of cost effective and efficient transformer technologies. Manufacturers across the globe have been continuously catering the rising energy efficiency demand through integrated or outsourced product-based research and development. Henceforth, rigorous research activities along with facility enhancements to supply customized product configurations have instituted a favourable business scenario. In addition, various alternatives to mineral oil including Natural esters, hydrocarbons, and silicone along with certain non-toxic, biodegradable, and renewable fluids have eased the regional oil filled distribution transformer market dynamics. 100 KVA oil filled distribution transformer market in 2017, exceeded an annual installation of 70 ‘000 units. Rapid adoption of renewable sources across residential establishments coupled with expeditious expansion of micro-grid networks positively influence the business landscape. Furthermore, growing demand for compact transformers for indoor applications coupled with cost sensitive consumer behaviour have compelled manufacturers to integrate a sustainable production mechanism. 250 KVA oil immersed distribution transformer market on account of the enlarging commercial sector across the region have witnessed a sheer turnaround in the recent years. Rising demand for manufactured goods favoured by flexible product operations across the primary and secondary distribution networks augment the industry growth. In addition, operational safety and energy efficiency compliance are projected to considerably influence the business landscape in the coming years. 1,001 to 2,500 KVA oil immersed distribution transformers since inception have gained moderate product penetration on account of sustainable cost and effective insulating properties. Manufacture of traditional transformer units have ever since been highly influenced by the availability and prices of the oil insulator technologies. Whereas, ongoing technological advancements pertaining to composite & solid insulator technologies may impede the product demand in the coming years. Germany oil immersed distribution transformer industry owing to positive outlook towards renewable energy coupled with decentralized generation technologies have gained prominent escalation. Ambitious energy transformation goals laid in the Energiewende, the nation by 2030 plans to integrate renewable energy across half of all electricity supply network. Henceforth, Germany continues to integrate cost-effective market-driven approaches to support the proliferation of variable renewable generation. France oil filled distribution transformer market is expected to account for over USD 200 million by 2024. Shifting trends toward the conversion of overhead electric lines to aerial bunched cables and underground network will complement the product penetration across the country. Advancing economic scenario will result in rapid expansion of micro-grid network, which will further augment the business outlook. Moderate GDP growth, energy consumption, rising export prices for energy, the preservation of the current sanctions restrictions in conjunction with current efficiency levels are key parameters defining the energy markets in Russia. Favourable regulatory policies coupled with positive outlook towards the deployment of micro-grid networks will foster the oil immersed distribution transformer industry size. New momentum for expanding cross-border inter-connections in electricity will enable Spain to utilize its large power capacity to increase diversity, flexibility, and security across the oil immersed distribution transformer market. The governments have focused on long-term issues including the reduced GHG emissions and maintaining the energy supply demand parity which in turn favour the industry dynamics. Prominent Europe oil filled distribution transformer market participants include Ruhstrat, Celme, Imefy, SGB-SMIT, Hyundai, Eaton, Siemens, Hyosung, Toshiba, Mitsubishi, Schneider, Crompton Greaves, General Electric, ABB. Inorganic expansion strategies along with rigorous research fund flow to suffice the accruing industrial competitiveness has been the foundation for growth and sustainability for the industry players. A distribution or service transformer provides voltage transformation in the electric distribution system through stepping down the potential difference across distribution networks to sustain networks at the consumer end. An oil immersed distribution transformer is differentiated with its technological counterparts based on the immersion of its magnetic circuit and windings in oil.